This bracelet is called “Traditions.” It could easily be worn with jeans and a tshirt or with business attire. 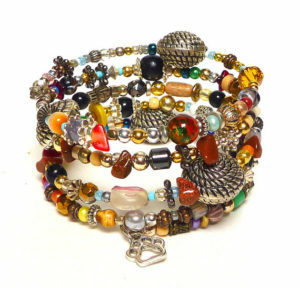 The bracelet is understated with a splash of pizzazz. For January, bracelet sales benefit Claws and Paws Rescue of Tucson. They feel all animals deserve a chance not just the cute and highly adoptable. They rescue pregnant, nursing dogs and cats and orphaned puppies and kittens and pets with curable diseases and deformities.